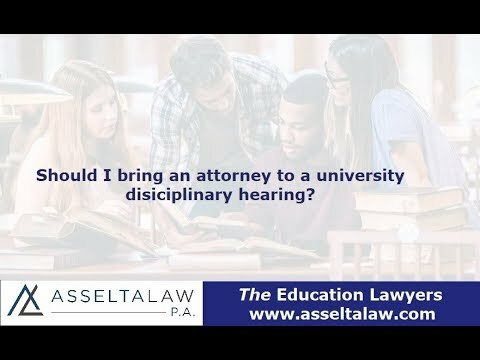 I often get the question: Should I bring a lawyer to a disciplinary hearing in college? My recommendation - Yes. Public schools allow advisers who are attorneys to attend disciplinary hearings with the accused student. Private schools are allowed to make their own policies so whether someone can come with a student depends on their policies. What can a lawyer for students do to help a student in a university disciplinary hearing? In most schools, they restrict the advisers role to student support. This means that an adviser cannot actively participate in the hearing, the student must be the one speaking. However, an adviser can speak to the student, write down questions, organize evidence, and other things to actively support the student to successfully represent themselves. If an adviser can't address the panel during the hearing, is it worth bringing an adviser? Yes. I think it is important that the school sees that there is someone there supporting the student. These hearings can be a lot of pressure and tend to make students nervous. My presence and support has helped students remain calm and clear minded. I keep the student on track and ensure that they make all of their defense points, present all of their evidence clearly, and question witnesses effectively. Another important point is that my presence makes the university play fair. I have heard horror stories from students who handle these hearings on their own and the school has not followed their own procedures and treat the students terribly. However, when I have attended with students, I have never seen this behavior take place.